Nikon’s latest go at an entry-level DSLR is nifty and light, with speedy image-sharing. So you’ve decided to introduce photography into your creative work – snapping your own product shots or portraits, for example – and you need a dedicated camera. If you’re new to the world of megapixels then it makes sense to pick up an entry-level model from one of the main manufacturers, and that’s a category that includes Nikon’s D3400. And you've timed it well as there's already some great Black Friday and Cyber Monday deals to be had. The 24.2-megapixel D3400 has a plastic body, without the magnesium alloy inner frame of pricier Nikons, but it doesn’t feel cheap, and has a nice chunky handgrip for a secure hold. It offers instant image sharing via Nikon’s SnapBridge functionality, which works using Bluetooth rather than Wi-Fi and is useful for quick sharing to social media. If, for example, you’d like to share some quick work-in-progress shots of your latest project on Instagram, this is a great tool to do so. Bear in mind though that it doesn’t transfer images at full resolution. The aforementioned plastic construction means the D3400 is nice and light, to the tune of just 445g, which is lighter than its predecessor the D3300. Unfortunately this has come at the expense of some useful features – the D3400 lacks in-camera vibration sensor cleaning, a useful tool for shaking stray specks of dust off the all-important image sensor. Similarly, its impressive CIPA-rated 1,200-shot battery life is undeniably handy, but does come at the cost of a weaker built-in flash than other comparable cameras (CIPA battery tests require some shots to be taken with the flash on). There are many thing that make the D3400 a great choice for creatives, not least its price. Buying into Nikon gives you access to the amazing stable of Nikkor lenses, and you can rent rather than buy these if budget is an issue, meaning you’ll be able to cover your bases for whatever photos your latest project might require. It shoots in JPEG or RAW file formats – handy for playing in Photoshop – and captures decent HD video. 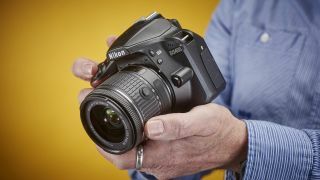 If you have very specific needs, such as fast-action burst shooting, then it may be worth looking at something more specialised, but for a solid all-around camera that’ll do its job well, for a good price, the Nikon D3400 is a strong choice.